Apple just announced iOS 10 at WWDC. Here are some of the great new features that it will have which you can incorporate within your next app release. Now apps can be integrated with Siri to provide services to their users. That includes, Audio/Video Calling, Messages, Payments, Photos. Now with iOS 10 you can create extensions that interacts with the native iOS messages apps. Your app can now send messages, media files and interactive messages. The User Notifications Framework allows you to handle the delivery of location and remote notifications. Now you can schedule the delivery of the local notifications based on certain time or location. This is a new API that allows a continuous speech recognition, which means apps now can translate speech directly into text in real time, i.e. as you speak, as well as for a recorded audio. Core Spotlight framework has new enhancements, such as, in-app search, search continuation. The whole lock screen in iOS 10 got a new facelift, so did the app widgets. New APIs are now available to make sure that your app widgets looks good on any background. 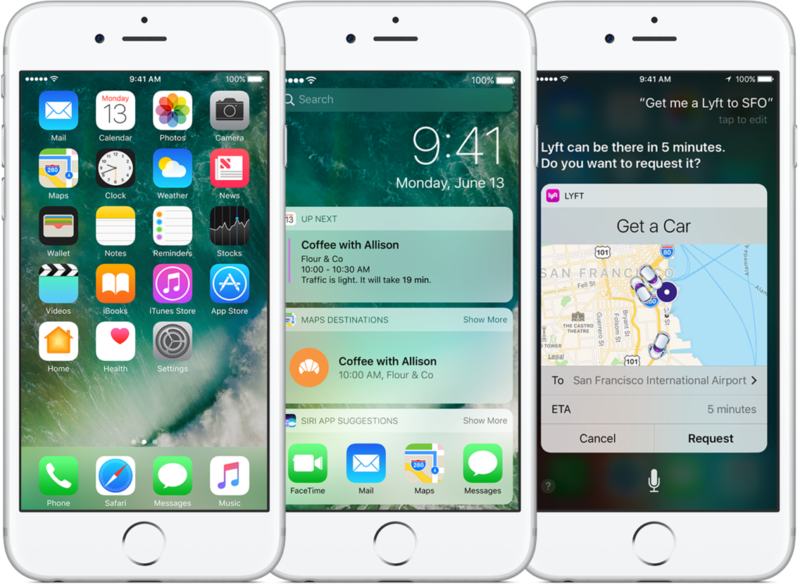 Now users can make payments using ApplePay by simply interacting with Siri or Maps. There are new APIs to use for both iOS and watchOS. Also there are new APIs for your website via Safari. This is a new kit in iOS 10 which allows VoIP apps to be integrated directly with the native phone app. This will make it easy to view and answer phone calls directly from the lock screen just like any regular phone call that you will get. VoIP calls will also show in the recent view of your native phone app! This is a new framework which allows app to authenticate with TV/Cable providers to stream or show videos on demand using the single sign-in approach. Users will sign in once, and view/stream using any app that provides that service. This is a great new feature for tvOS as well. Such as, Call Directory, Intents, Messages, Notification Content, Sticker Pack. As well as new enhancements for the 3rd party keyboard app extensions, where apps can now detect the input language of a document and change the keyboard to match that language. There are a lot of new and cool features, enhancements and API to discover in iOS 10, such as improvements to: AVFoundation, AVKit, CoreData, Core Image, CoreMotion, GameKit, GameplayKit, HealthKit, HomeKit, Metal, Photos, WebKit, and much more. What you read here was just a quick summary of what’s new, for more details you can visit the Apple Developers website, or click here.